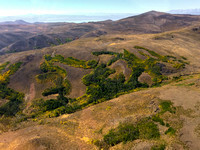 The unusual and beautiful Bodie Hills are important wildlife habitat for pronghorn antelope, mule deer and sage grouse. This area, bordering Yosemite and the Sierra Nevada Range, provides a recreational haven for local and tourist economies, and includes Bodie State Park, the Mono Lake National Scenic Area and the Bridgeport Valley. These national treasures surround the very heart of the Bodie Hills area which faces threats from large-scale gold mining interests, which would limit visitor access and compromise the clean air, clean water, wildlife habitat and recreational opportunities. Bodie Hills is a mix of BLM, USFS and private land. Three BLM Wilderness Study Areas (WSAs): Bodie, Bodie Mountain and Mt. Biedeman would be threatened by mining. Two other WSAs (Masonic Mountain and Mormon Meadow) were released with passage of the Omnibus Public Land Management Act (2009) and yet contain true wilderness. It would be shortsighted to allow industrial mining development in this spectacular landscape.